Maps & Atlases was formed in 2004, with the band mem­bers still in col­lege, and since then, they have released quite a few EPs. Perk Patch­work, how­ev­er, is their first full length album, and it was worth the wait. The band has exper­i­ment­ed with their folk-rock sound, mod­i­fy­ing it to enough of a degree over these past years that it has tru­ly become a com­plete­ly unique sound, with only the bare rem­nants of either folk or rock. Perk Patch­work is an excel­lent and beau­ti­ful album, a clear and wor­thy suc­ces­sor to Maps & Atlases’ past. Maps & Atlases’ per­cus­sion is eas­i­ly one of the most unique ele­ments of the album. Say­ing that it acts as more than a metronome would be an amaz­ing­ly gross under­state­ment. The drums and per­cus­sion of Perch Patch­work is such a well fleshed out beast that vocals and per­cus­sion alone could eas­i­ly form full, rich tracks, and they very near­ly do in more than one occa­sion. This is, of course, not to say that the oth­er instru­ments slack off. There is an amaz­ing amount, musi­cal­ly, that is sim­ply incred­i­ble on Perch Patch­work. Tran­si­tions are invari­ably per­fect, whether clean dividers between con­trast­ing sec­tions of a track or slow shift­ings that, for exam­ple, serve to val­i­date the open­ing track “Will,” oth­er­wise a bit lack­ing in con­tent, as a ful­ly devel­oped song by blend­ing it per­fect­ly into its suc­ces­sor. Maps & Atlases also man­ages to flirt quite suc­cess­ful­ly with often dan­ger­ous tech­niques such as rep­e­ti­tion and uni­son, some­how always per­fect­ly fit­ting and bal­anced by the depth of devel­op­ment of some oth­er ele­ment. Maps & Atlases’ vocal duties fall to Dave David­son, and he does an absolute­ly amaz­ing job with them. Davidson’s voice is ele­gant­ly reedy, a sound that seems to have been devel­oped from a coun­try twang to some­thing not quite that. At times whiny, though nev­er exces­sive­ly so, Davidson’s pas­sion­ate wail­ing enchants the lis­ten­er while nev­er sound­ing over­ly stressed or stretched. Where nec­es­sary, David­son can also dou­ble as a rich bari­tone, seem­ing­ly at odds with his stan­dard range, yet per­fect­ly fit­ting. Though it can some­times be hard to deci­pher what David­son is singing, as he tends to obscure words by slur­ring, even if he isn’t slight­ly over­whelmed by the instru­men­tals, what can be heard is quite inter­est­ing. The first lines on the album, on “The Charm,” are: “I don’t think there is a sound that I hate more / than the sound of your voice.” While the lyrics are nev­er more clear, both in mean­ing and audi­bil­i­ty, the lyri­cal con­tent rarely suf­fers, even as one of the objects of least impor­tance on Perch Patch­work. 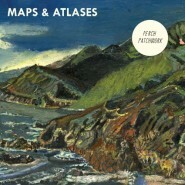 Seem­ing­ly no mat­ter what Maps & Atlases does, it sounds excel­lent. Per­haps this is a result of Perch Patch­work being a long time com­ing, per­haps it is the band’s exper­i­men­tal nature, or maybe Maps and Atlases sim­ply has the mag­ic touch, but what­ev­er the rea­son, Perch Patch­work is an incred­i­ble piece of work. Real­ly, the only sad part of the release is that there’s not much else by Maps & Atlases to lis­ten to when you’re through with Perch Patch­work.